The H.265, or as it is more commonly called HEVC, was approved by ITU and ISO on January 25th, 2013. There’s no doubt the HEVC compression format provides a significant quality increase over the previous H.264 format. 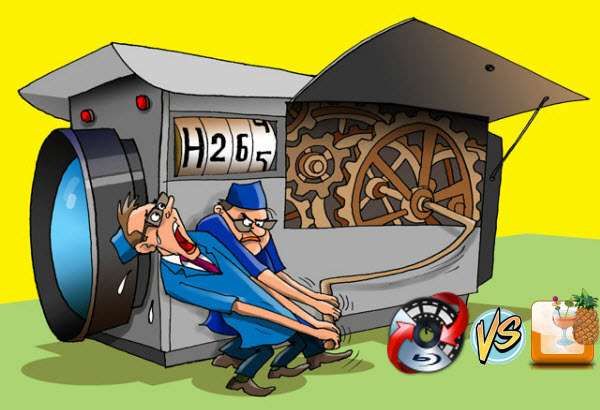 Have you enjoyed the benefits of H.265? With wave of HEVC capable encoders and decoders will also coming to market, you may wonder which one is best. Here offers you two new H.265 converters that can handle this job well. Pavtube Video Converter Ultimate is a powerful H.265 encoder, decoder and converter. It can mainly help you to transcode Blu-ray, DVD, video to a specific video format and for use on multiple video player devices. Besides that, you are also able to convert DVDs/Blu-rays to H.265 videos for feasible playback, downsize large HD videos with nothing lost to an H.265 video, or turn regular non-H.265 videos to H.265 for better video quality, and vice versa. It’s easy to use, and performs professionally. 1. Launch the HEVC/H.265 Video Converter and import video source to it. 2. Choose output format via clicking the Format bar and choose “Common Video > H.265 Video(*.mp4)”. If you prefer a smaller file size, click Settings to adjust the video size, video bitrate, frame rate. 3. Press the big “Convert” button to start the H.265/HEVC Video encoding and decoding process. After the conversion, you can watch your H.265 videos anywhere at your will. HandBrake is an open-source video transcoding tool that I use each time I upload a video on YouTube, simply because it will let me crop the beginning or end of a video as needed, can make web optimized videos, has an easy to use user interface, and greatly reduces the size of the video shot with my camera. HandBrake 0.10 has now been released, and it adds H.265 and VP8 encoding support via respectively x265 v1.4 and linbpx, as well as QuickSync video support, but the latter only in Windows. There are also various other changes include OpenCL accelerated scaling. I’ve tested with the video I shot yesterday, to see if I could get half size by using H.265 codec instead of H.264. The original video is a 720p QuickTime video using H.264 codec at 25 fps, and that lasts 10 minutes and 20 seconds. I selected the default settings for both H.264 and H.265, as well as “web optimized” MPEG-4 (.m4v) video container. My computer is powered by an AMD FX8350 octa core processor running Ubuntu 14.04. Here are the results. H.265 is now available through x265 1.4. While this encoder is still fairly new, we have seen some promising results come out of it. It’s still under heavy active development and is only going to improve over time! It often crashes when dealing with encrypted DVDs. Compared with Handbrake, I like Pavtube best. Since it is not only an effective Blu-ray/DVD Ripper and Video Converter to deal with protected BD/DVD, H.265 videos, but also provides optimized video formats for most popular devices. It has a brilliant video editor to Cut, Split, Merge, Rotate, Crop, Trim videos and add subtitle, video effects, watermark, etc. and you can freely adjust your output videos with the style that we want by clicking “Settings”. Notes: If you have already owned the Pavtube Video Converter Ultimate, just open the main interface and select the ‘Help’>>’Update’ to upgrade to the latest version 4.8.4.0 for free. The Real Codec Battle is VP9 vs H.265, which is the winner?